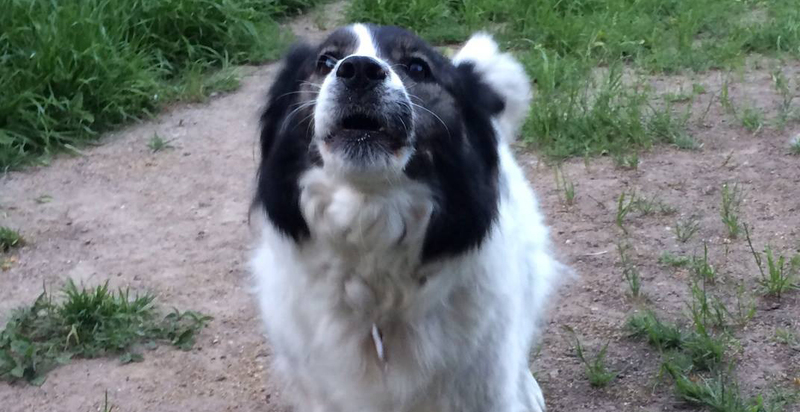 Barking is defined as vocal communication, but that communication can have many meanings. Let’s look at some of the types of barking and what causes them. Each type may have a slightly different training plan to decrease it, so knowing your barks can be very helpful. Alert barking is probably the most common type of barking trainers see. It’s the “Hey! Something is out there!” or “I don’t know what you are but you’re freaking me out! Go away!” It doesn’t always mean aggression, although it can certainly include that. It really is just a “there’s something in the environment,” communication. Alert barking is slightly higher pitched than an aggressive “get out of here” bark, but not quite as high as the excited or attention seeking barking. Unfortunately, alert barking to make things go away is often unintentionally reinforced. The mailman that comes 6 days a week, gets barked at, and goes away 6 days a week. Dogs don’t know he was going away anyway, they just think that the barking made him go away. The same holds true for people and dogs and bikes going by on the sidewalk. Dog barks, the things go away, and the dog thinks it was all thanks to their nifty barking. It can be helpful to log alert barks for a week or so to see if there’s some consistency. Did the dog bark at a sound? Or did they wait until they could actually see something to bark at? Is barking more common at a certain time of day? Or, the flip side, is there a time of day that barking is naturally decreased? Client Story: I had a fun client with a dog that persistently barked at 3am. 3am on the nose the dog would bark and bark at apparently nothing. After keeping a log to show the consistency of it we weren’t any closer to understanding it. One night the client was unable to sleep and at 3am on the nose heard the neighbor’s pool pump kick on. The dog barked and the solution was finally found. Unfortunately, attention seeking and demand barking both get unintentionally reinforced. If the human says, “Quiet” or “No bark!” the dog just got attention and the barking worked. If the barking is so persistent that the human gives in, gets the ball and goes out to play, the barking worked. It can be very difficult to ignore a persistent attention seeker. Humans have a threshold and it’s that one last bark that sends us over the edge and we give in or give attention. Again, logging the barking can be very helpful. This type very often happens at the same time of day and increases slightly during the work week. As we get tired and start putting off walks and play, the dogs get frustrated. Logging will show where those times are happening and plans can be made to accommodate the dog’s needs or teach a different activity time. Anything can cause anxiety, but this type of barking is frequently seen with isolation distress or separation anxiety. It isn’t high pitched and playful, and it isn’t deep and aggressive. It’s repetitive vocalizations over and over and over and is a basically plea for help. Unfortunately, the common thought for this type of barking is to let the dog “bark it out.” This rarely works, and if the human gives in the barking is reinforced. If the human tries to let the dog bark it out and gives in after an hour, the human just taught the dog that barking for an hour gets the human to reappear. Decreasing this type of barking after a few of these lessens can be difficult and costly. Logging anxiety barking and what you’ve tried to lesson it can be helpful. If it’s separation or isolation distress, getting neighbors to help with the log or getting a video camera in your home to watch will help create the training plan. Distress is complicated and the behavior modification really needs an educated professional to help with it. This is the barking that stops you in your tracks. You can feel it in your chest. There is a threat to it. Whether the dog is moving foward or moving backward, this bark says “Stay away!” and “Get out of here!” This bark is deep and includes a hard, staring eye and a very stiff body. Unfortunately, this type of barking is the most frequent type to be punished as are the earlier signs of aggression. On the surface punishment makes sense, humans feel threatened and we want it to stop. Unfortunately, the barking is not something we want to stop right away. We want the dog to stop at a growl. We want the dog to stop at a bark. If the earlier warning signs are punished in order to try to decrease them, the dog will have no option but to bite. Decreasing the vocalization is not decreasing the fear or threat response the dog is feeling. Taking away communication should never be on the table. We need to know what the dog is experiencing in order to effectively modify their behavior. The lines between defensive aggression, guarding aggression, territorial aggression, and just aggression are subtle. If you are experiencing aggression, whether it’s resulted in a bite or not, you should not attempt to “train” or “modify” the behavior alone without an expert. Doing so could result in a bite and a loss of life, either canine or human. Aggressive barking is a threat. It’s communication that more is possible, so please back up. Logging aggressive responses can be incredibly helpful, but should include a little more detail. Who was being barked at, what was the environment like, and what did the owner do. This log will help a behavior consultant define the triggers and create the behavior modification plan. ~ Does your dog bark? What’s the most common bark that they do? Tell us in the comments!